Female macroptera. Body and legs yellow, also antennal segments I–III, IV brown in apical half, V yellow with apex shaded, VI–VIII brown; fore wings pale with weak transverse dark marking. Antennae 8-segmented; III–IV with weak apical neck bearing long forked sensorium; VIII longer than VII. Head wider than long, with 2 pairs of ocellar setae; ocellar setae III shorter than II, arising either on anterior margins of or else within the triangle; postocular setae I longer than rest of series; mouth cone long, extending between fore coxae. Pronotum with weak markings, 20–26 strong discal setae present; 2 pairs of stout posteroangular setae; 3 pairs of posteromarginal setae. 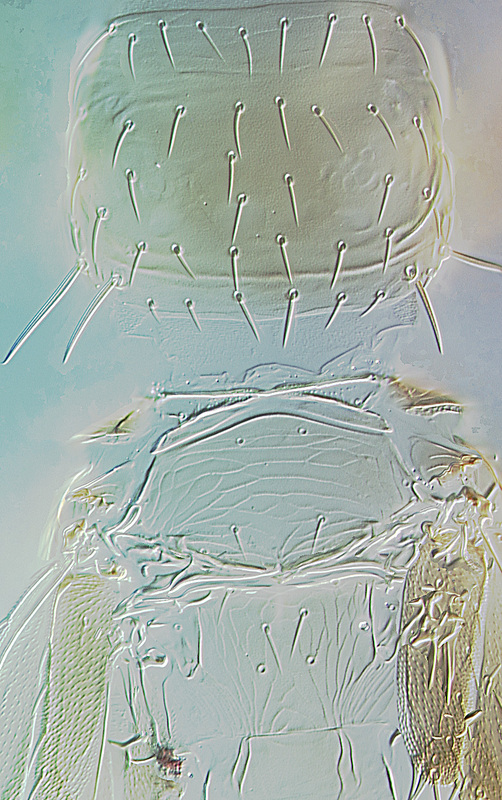 Mesonotum with sculpture lines near anterior campaniform sensilla. Metanotum transversely striate, anterior campaniform sensilla present. Prosternal ferna weakly complete; mesofurca with weak spinula. Fore wing first vein with 3 widely spaced setae on distal half, second vein with 4 widely spaced setae; clavus with 5 veinal and one discal seta, terminal seta twice as long as subterminal. Tergites II–VIII with smooth craspedum, median area reticulate; VIII with groups of microtrichia antero- and postero-laterally. 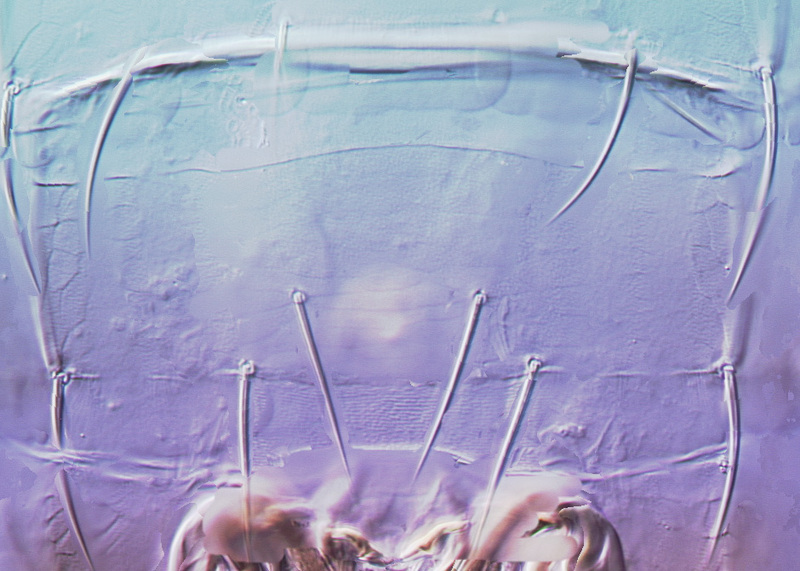 Sternites III–VI with broadly lobed craspedum, no discal setae; VII setae S1 far ahead of posterior margin, S2 much closer to S1 than to posteroangular setae S3. There are six species listed in the genus Tusothrips, between India and the Philippines. 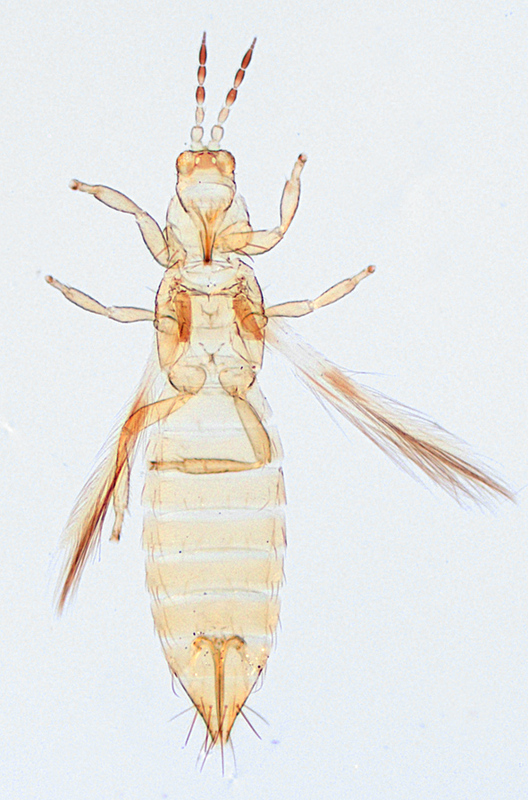 This genus shares with Rhamphothrips the close placement of setae S1 and S2 on sternite VII of females, although in Tusothrips species they are slightly further apart. 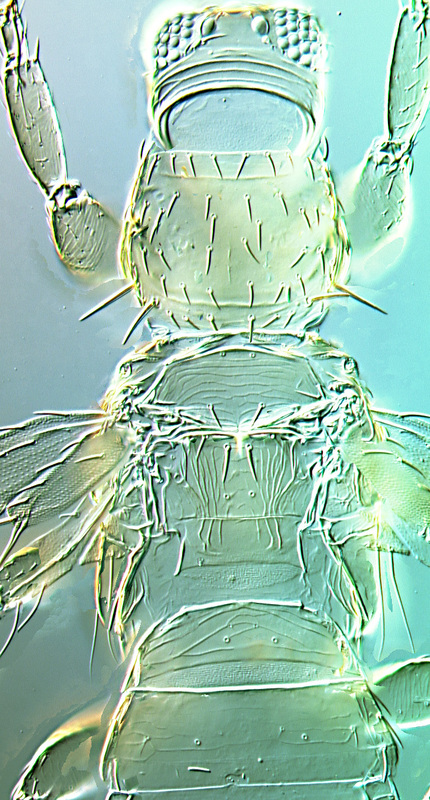 Moreover, Tusothrips species have two pairs of pronotalposteroangular setae (Mound & Tree, 2011). Presumably feeding and breeding on leaves.